What's on the Other Side (of the Door)? Don’t you want to know … what’s on the other side? We live in an age of instant gratification. We want everything to come to us yesterday. Easily. Without a whole lot of effort. We want the prize right now. We want our rewards to be immediate. We don’t want to have to sweat. Or feel exhausted. Or sore. That’s why we put off going to the gym. Because we know the extra weight is not going to just fall off with a few strides on the treadmill. We’re going to have to work. Hard. We don’t want to have to think about what’s on the other side. Because we might have to change our course of action. Our modus operandi. We might have to give up a few vices. We’ve become conditioned to entitled indulgence. People don’t want to have to pay their dues anymore. To put in the quality time. To source and use quality materials to produce a lasting, artisanal result. Just come up with an idea and garner an immediate positive response that leads to rapid wealth. Disposable income. When in the world did income become disposable? Anyway … sigh … we call these get-rich-quick schemes. Then again, sometimes we do want to know what’s on the other side. We sometimes wish that we could predict the future. That we might know what’s on the other side of every door we come to. But wouldn’t that show Let’s Make a Deal be a lot less exciting if we could see behind all the doors and curtains before the contestants do? Not having the answers is what makes life intriguing. What we may not consider is that knowing all the answers in advance is scary. A lot more responsibility than any one of us can handle. If I know in advance that the 50th book I write will be the best seller, how will that affect my dedication to the art and craft of writing? Will I be so overwhelmed by the task of completing those first 49 books that I never make it past the fifth one? Or will I be so driven to get to that 50th book that I will rush through the preceding books and not put forth my best work? Or … knowing how much work it’s going to take to get to 50, would it not be easier and a whole lot less work to just quit now? Sometimes it’s better not to know what’s beyond the closed door. Sometimes it’s safer. Sometimes it leads to increased dedication. Even though we may be afraid … we still can’t help but wonder what will happen once we grasp that doorknob and turn it … We should still go ahead. 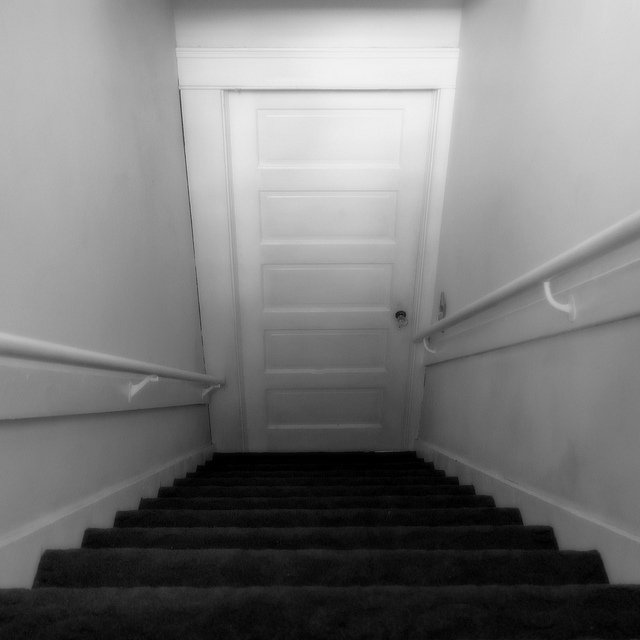 take those stairs to reach the door. And then make the decision. It may take us a while to get there. We’ll have a lot of time to think about what we’re doing. A lot of choices to make involving perseverance. Being a writer takes a lot of patience. Writing can feel as if we’re calling out into a black hole. Writing down a long staircase with no idea what will happen when we get down to that door and open it. Who’s out there? A viable character? A compelling story? Who’s listening? Will anybody welcome us? But keep writing. Don’t stop short of the door. You never know – what’s on the other side waiting for you could be awesome.